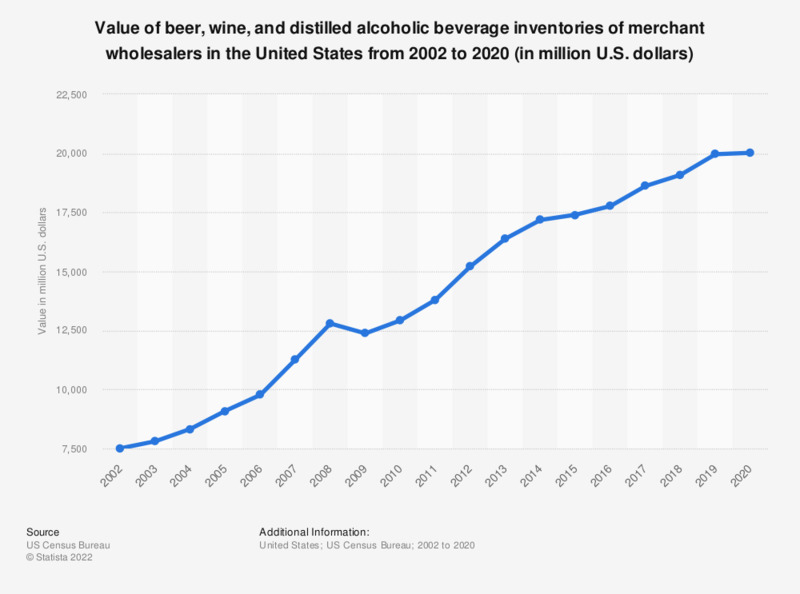 The timeline shows the value of beer, wine, and distilled alcoholic beverage inventories of merchant wholesalers in the United States from 2002 to 2016. In 2016, the value of U.S. wholesale beer, wine, and distilled alcoholic beverage inventories amounted to about 17.99 billion U.S. dollars. Inventory estimates are based on data from the Annual Wholesale Trade Survey. Estimates have been adjusted using the preliminary results of the 2012 Economic Census. Estimates have not been adjusted for price changes. Additional information on confidentiality protection, sampling error, sample design, and definitions may be found here.